For a heart-warming dinner full of delectable flavors, try this chicken casserole recipe. 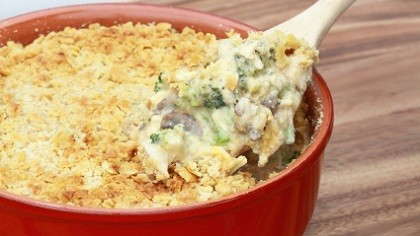 Recipe for a quick and easy chicken casserole. The whole family will go back for seconds! Step 1- Arrange chicken in casserole dish. Mix together celery soup, and chicken broth; add onions and butter. Pour mixture over chicken and season with salt and pepper to taste. Step 2- In separate bowl, blend Bisquick and milk. Stir into chicken and soup mixture; add frozen vegetables. Bake at 375 degrees for 45 minutes or until golden brown crust forms.